March Madness -- it’s not always pretty. Went to the first day of the 2009 NCAA Tournament's opening round at the Sprint Center with some friends on Thursday, and grabbed lunch while I was there. Now I don’t know for sure that during the construction of the Sprint Center there was an ongoing top-secret development process underway to create a signature Kansas City-related menu item, but I like to think there was. And whoever said “let’s just throw some brisket on an unnecessarily large hot dog” deserves a raise. The 1/2 Lb. KC BBQ Dog is a ridiculously huge all beef hot dog, topped with brisket plus onion straws and “famous” barbecue sauce. About the only thing that could make it more Kansas City is if the sauce was from Arthur Bryant’s or Gates or one of the other estimated 17 gazillion barbecue joints here in town, rather than being a sauce vaguely called “famous.” Which I’m pretty sure is code for “we buy it by the vatful.” Keeping in mind that arena food is always overpriced, at $8 I don’t feel like I got fleeced too bad, either. Not so much with my $4 soda. Between sessions we went to Grinders, and I got the Thursday special of three for a dollar tacos. I knew they’d be fantastic when the waitress told me they were taking a while because they were “still on the grill.” Grilled tacos! Sure enough, they were way delicious. Even though the tacos are grilled, they actually come out pretty soft, filled with seasoned taco meat and melted cheese -- picture a floppy quesadilla. This is about the closest I’ve come to Amigos soft tacos since that outfit closed up shop around here. Finally, here is some expert Lunch Blog tournament commentary -- and by “expert,” we mean it’s all about the mascots and pep bands. There was no way the Maryland Terrapins weren’t going to win -- they had turtle power! Seriously, Testudo the Diamondback Turtle busted out some sweet moves every time the pep band played the “Teenage Mutant Ninja Turtles” theme. Meanwhile, the California Golden Bear was just kind of aimlessly meandering around with his hands behind his back. Lame. I hate the California Golden Bear. 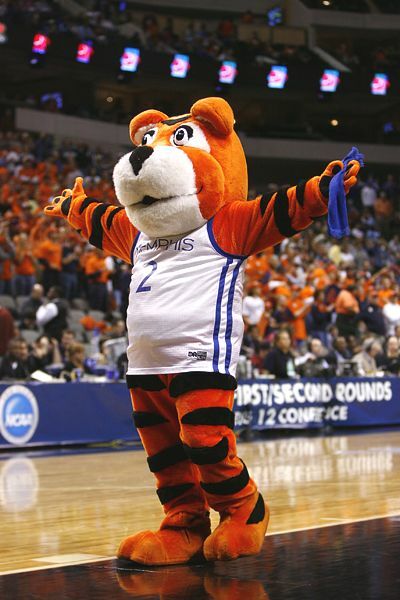 In a fight between Pouncer the Tiger from Memphis and the Clemson Tiger, the Clemson Tiger would win. However, in a dance-off, it’s Pouncer, no contest. Note to the CSU Northridge pep band: “Handlebars” by Flobots is an intriguing choice, but it’s not working for you guys. Also, your mascot Matty the Matador and Jay Leno are one and the same. Boldly breaking the $10 BK Barrier. En route to Burger King to get some BK Burger Shots, Nick and I started reminiscing about BK Tacos. They were kind of like those mini-taco appetizers you can get at some T.G.I. McGillicutty’s-type establishments, but greasier and in full-size taco form. Turned out Nick was a fan of BK Tacos as well, and we lamented how they were cruelly discontinued in the KC region. Moments after we got in line, Nick pointed to the BK Favorites menu and simply said, “Tacos.” Sixth Street Lawrence Burger King, I love you. That’s how I ended up northwards of $10 for lunch at Burger King. One order of tacos, plus a six-pack of Burger Shots with cheese combo, which I upsized so I could take the monster soda back to work with me. Total: $10.17. There was a surprise bonus onion ring in my Frypod -- maybe that’s my reward for dropping a Hamilton. The Burger Shots weren’t bad, but they’re not going to satisfy any cravings for White Castle or Krystal sliders. They’re actually just your standard BK cheeseburgers, all tinyfied. Same unmistakable BK flame-broiled taste. Burger Shots come in a six-pack (too many) and a two-pack (too few). King, I humbly beseech ye for a Double Stacker Burger Shot or a Loaded Steakhouse Burger Shot. The tacos, however, were as awesome as I remember. BK Tacos are a fried taco shell filled with like a ground beef meat paste, lettuce, a slice of cheese (not shredded but a slice), and hot sauce. They’re neither truly a hard nor a soft taco -- even though the wrapper says “crispy,” that’s really only true around the edges. The closer you get to the middle, the taco gets deliciously chewy. The deal is, either you’re on board with BK Tacos or you’re not. I’ll admit, the first time I tried them was out of pure curiosity -- but man if I didn’t dig them. Back then they were priced at $1.09 for two. Now an order of two BK Tacos costs $1.99. And they will only sell them to you two at a time. Want three? Too bad. Buy four and throw one away. I understand these are pretty much the same tacos you can get at Jack in the Box, although I couldn’t say for sure since we don’t have Jack in the Boxes around here. On the way out, Nick picked up a Burger King crown. Printed on the inside are rules for BK-related games you can play -- none of which are a Burger Shots Eat-Off. I’d be all over that.